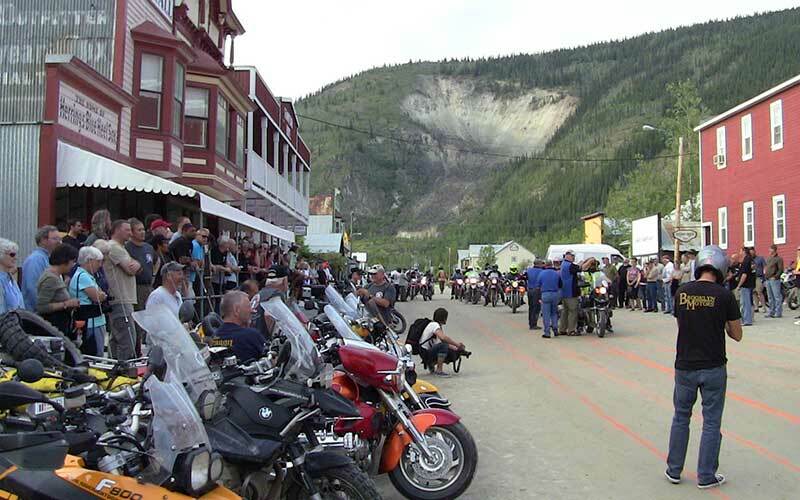 When I was planning my Ride Right Down trip and looking to the Alaska Regional forum on ADV Rider for inspiration and advice I couldn’t help but realise there was to be a big adventure rider gathering in Dawson City, Yukon, around the time that we would be coming through the region. 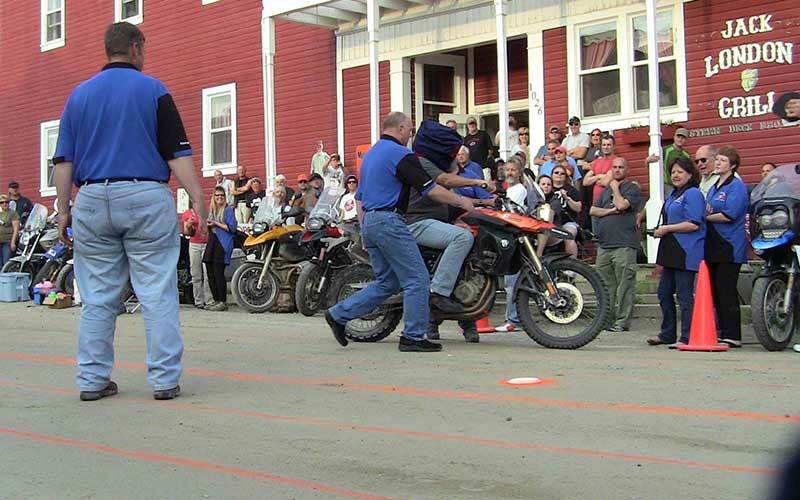 The ‘Dust 2 Dawson’ (D2D) as is known began as a homage to a fallen friend and gradually built up to a pilgrimage for riders from Alaska, Canada and the lower 48 states. I thought it would be an ideal thing to do at the start of the trip to meet people and get advice for our journey down. 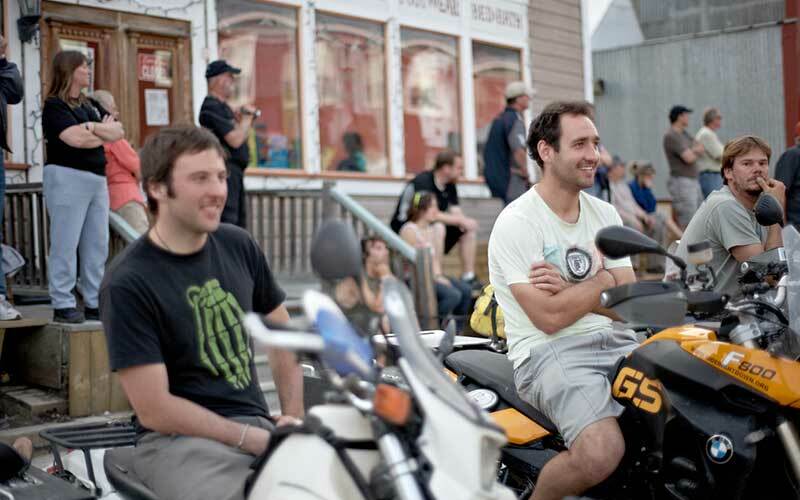 This year there were over 200 riders in town to celebrate the event, the formalities of which included a poker run (where you got to certain points on the map and draw a card at each one. Highest poker hand at the end wins half the kitty – the rest goes to charity), bike games in the main street (which were quite amusing) and a big dinner. We had a chance to meet a lot of the guys that organised the event and they were really genuine blokes. Happy that we’d made the effort to join them and keen to talk to us about our trip. All of the organised events were great, well organised and got you out and about checking out the local region and meeting new people. At the dinner I was making new friends and got talking to them when the door prizes were being handed out. I’d donated an item to the kitty (a faux kangaroo scrotum bottle opener), which I thought would be a bit of a novelty and when it was announced it got a great reception. One of the guys on my table that I had been talking to actually started to suss out the chances of getting one sent over, which I was all for, until providence would have it, he won it anyways. Apart from the organised activities there was plenty of shenanigans to be had around the town on our own. We had beers with Wade and Phil (the two Aussies that are on there way down to Antarctica) and caught up with CJ, Matt ad Arty, who we’d first met in Fairbanks. Everyone parked their bikes on the main street (which was quite a sight) and just hanging around there was a great place to chat with people about their bikes and their adventures. Being Australians and given the trip that we were undertaking, we were a little bit of a novelty and were never not chatting away. Apart from talking about bikes all weekend (those who know me know that its something I can easily do) there was also a bit of a serious matter that needed to be attended to… the Sourtoe Cocktail. What on earth is that?, I hear you asking. Well the Sourtoe Cocktail involves nothing more (and nothing less) than drinking a shot of Yukon Gold whiskey out of a glass that contains a human toe and having said toe touch your lips! Not real sure of the origins, but its been going on for decades and while it i quite the tourist tickoff is still something pretty unique. Sitting up the back of the bar is ‘The Captain’ (I’m guessing some bloke they hired for the summer to play the role – not sure how genuine he was), whom you approach with your shot in a rocks glass (and you can have any spirit, but it’s traditionally Yukon Gold) and sit don to hear the spiel about the greatness that comes from the rite and then in your own time raise the glass to your lips and imbibe the rough whiskey (and hopefully not the toe). I was a bit nervous I have to say. I’m not exactly known for my strong stomach. Jock had bets on that I would power-spew all over the shop and filmed the whole thing, not to show the folks at home what I was doing, but more just in the off chance that I would come apart spectacularly. Not such luck for him though, as all was fine and handled with utmost dignity. One of the main reasons I wanted to come to this event was to talk to people about options for our route down through Canada and the states. Meeting CJ, Matt and Arty I found out that they were planning to head down the Continental Divide Trail all the way to Mexico, which was essentially the same route that we wanted to take and so we decided to tag along with them for a bit until it was time to go our on way.